While most modern musicians of the Berlin-School plead with critics not to peg them as mere mimics of vintage Tangerine Dream or Klaus Schulze - Graham Getty & Stephan Whitlan most candidly profess to avidly trying to copy the classics. The album Even Higher Green (99'34") offers four tracks (plus two bonus tracks) that are a direct response to the excitement they felt at first discovering TD's Ricochet (1975) and Encore (1977). 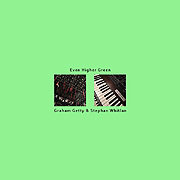 Even Higher Green, the follow-up to their equally derivative Higher Green Session (2014), is a pure and honest effort to have some wondrous fun with the sounds, synths, atmosphere and form from Spacemusic's classic era. Yet, even with this admission, Getty & Whitlan manage to include their own original ideas and innovations into the music - and so this work is a few degrees more refined than the original. For one thing, this album sounds cleaner than the old ones do. Also, unlike their predecessors, all the instruments manage to stay in tune throughout the duration of each piece. Getty & Whitlan may be more proficient players too. As impressive keyboard leads unwind over stumbling and tumbling ratcheting sequencer patterns, heavenly chords hold and confirm this duo's interstellar message. While droning electronics provide foundational texture, glittering effects open up space above. One sonic image blends into the next, as expectations rise, and are met. For a work inspired by such a cerebral medium, Even Higher Green feels full of passionate intensity. This duo conveys a wide range of expression, indicating the musician's restraint, vigor, or willful abandon - but we know this music is an end unto itself. It may be that in the qualities of simplicity, directness and raw energy, Getty & Whitlan have discovered a machine-age outlet for the imagination - the most powerful force for human freedom.